Humanity was not the first to walk among the stars. Their existence is a mere blink of an eye to the immortal beings that still exist. A discovery has been made that may lead to a savage upheaval in their aeon-long dormancy. Captain Uriel Ventris of the Ultramarines must fight to defeat both fiendish aliens and diabolical men in a race for an ancient device of galaxy-destroying power! Nightbringer was written a long time ago (it feels), though having just checked the Date created portion of the prologue, it turns out it was on Wednesday 7th of March 2001. 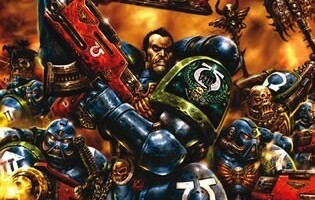 I’d been with Games Workshop for just over a year and I was writing my first novel. Well, not actually my first novel, but the first one I was being paid for and which had to be written by a certain date. I’d written part one of a novel during my university years (which might explain why I’m following this career path instead of that of an architect or a surveyor) but it was a rambling three-hundred page epic that was just part one of…well, I never got to find out how many parts it would be, but you get the idea. As many of you will have heard if you’ve spoken to me or read the introduction to the Ultramarines Omnibus, Nightbringer came about after a conversation I’d had with the then editor of Inferno! magazine, Christian Dunn, where he asked me if I’d like to write a novel about Space Marines. It had to be a Codex Chapter since Bill King’s Space Wolf novels had the left of the middle Chapter angle covered, but that wasn’t a problem, as I instantly wanted to do a novel based on the Ultramarines, since I felt they were getting a bad press as a ‘boring’ Chapter. I quickly realised that much of this was because, as a Warhammer 40,000 army, they had no special rules like the other Chapters had and were often the army newcomers to the Warhammer hobby were urged to collect. Older, wiser heads had therefore decided that the Ultramarines were a kid’s army and boring (possibly because they played against so many of them). This was a notion I profoundly disagreed with having read and re-read the background presented in Codex: Ultramarines many years back. So, armed with enough righteous indignation to fuel a Space Marine Battle Barge, I began my quest to change people’s opinions by writing a short story called Chains of Command, where I introduced what was to be my main character, Uriel Ventris. That story was fun to write and gave me the confidence to try and plan out how the novel would go. Looking back, the synopsis and the finished novel bear little resemblance to each other, but trust, me…that’s a good thing. I remember sitting in Bugman’s Bar with Marc Gascoigne and Lindsey Priestley to talk about the plot and characters. I still shiver when I think of that and the questions they grilled me with, but it was absolutely necessary and gave me the questioning attitude I always have when I look through my synopses or writing, the knowledge to look at a plot or scene and answer every, ‘but why don’t they just…’ moment. There then followed a heartbreaking couple of days when I had to trawl through the manuscript and cull thousands of words crafted with painstaking care and love. Only now, at the end, did I truly understand the phrase, ‘murdering your darlings’. But at the end of it all, the novel that came out the other end was leaner, tighter and just plain better than the original, so it wasn’t wasted effort and since many of the scenes were excised in their entirety, I was able to fit them into other books where they fitted the story (or I bent them to fit!). So it was done, my first novel, and the feeling I had when they handed me the first, glossy copy of it, complete with its wonderful, new-book-smell, the feeling was like nothing I’ve ever experienced before (well, at least until they handed me my son…). And though I’ve written plenty of books since then, I feel the same thing every time I get handed the first copy of one of my books. Weird, huh?